For realz! He even has his own website and Facebook page, natch. Aren’t his little saddle, chaps, and hat adorable? 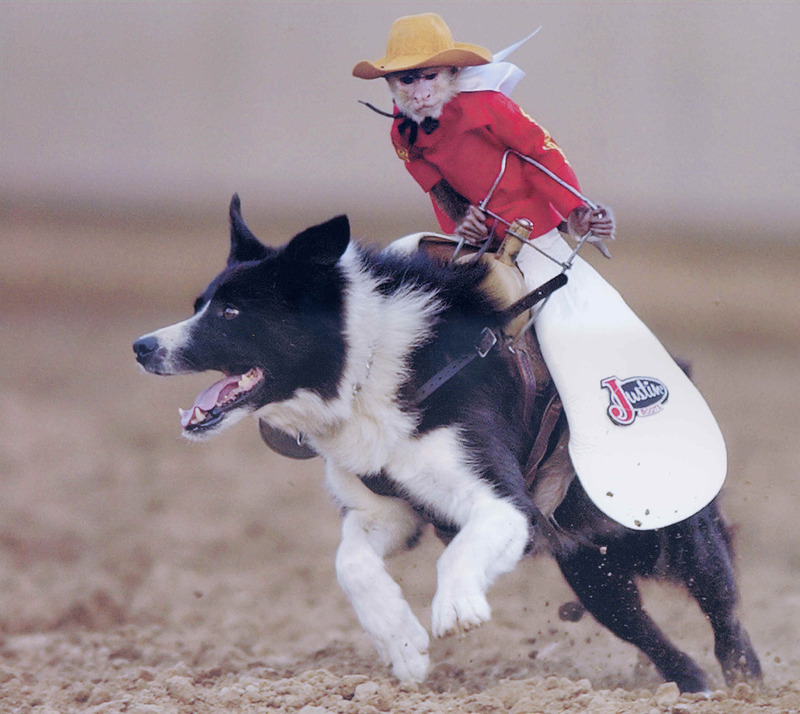 He’s made several appearances at the National Western Stock Show & Rodeo in Denver, held every year in January. Hope all of you and your critters are hanging in there. Is it in the running? One tough-looking hombre, is all I can say. The dude wearing the red shirt looks pretty formidable, too. What’s that ze’s holding, a campfire toasting iron? All’s well here in the East, Historiann. For president? I don’t think he’s old enough. According to the second linked article, he was 19 in early 2007, so I think he’s only about 23 now, and one must be 35 to serve as president. I don’t think the U.S. Constitution specifies that a president be homo sapiens, just a native-born citizen and 35 years of age. (I guess we could get caught up in the question of whether or not a capuchin monkey is a citizen, though, as animals have never had voting rights in the U.S. nor have they ever been counted for purposes of congressional representation. I suppose you’re free to write in anyone you want on your ballot next fall. Thanks, Western Dave! I love that song, and it was of course going through my head the whole time I was writing about Whiplash. I love it so much I bought the CD. Many fine tracks for the absurd minded among us, especially Wedgie and Same.